Editor's note: This is the second in a series Dispatches from the Arctic on the August science cruise by NOAA and partner scientists aboard the U.S. Coast Guard icebreaker Healy. Today's post is from Meredith LaValley of the Interagency Arctic Research Policy Committee and the NOAA Communications team. Since 1984, scientists have been gathering information about the physical ocean environment such as ocean current patterns, water temperature, and sea ice distribution. Researchers have also tracked the abundance and distribution of fish food sources such as zooplankton, and studied the early life stages of fish. “The research helps us understand what factors affect the health and populations of ecologically and commercially important fish and other marine species, and how ecosystems are responding to change,” says NOAA’s Dr. Phyllis Stabeno, a co-lead scientist on the project. As Healy travels northward across the continental shelf of the Bering and Chukchi Seas, EcoFOCI scientists service ocean moorings that have been in the ocean for 3 to 12 months at a time. A typical mooring includes a large yellow float that suspends sensors in the ocean, like a balloon attached to the seafloor. When scientists retrieve these moorings from the ocean, they are able to access sensor data on ocean temperature, ice thickness and many other variables. Some specialized EcoFOCI moorings are even equipped with passive acoustic sensors that can capture sounds made by marine mammals. 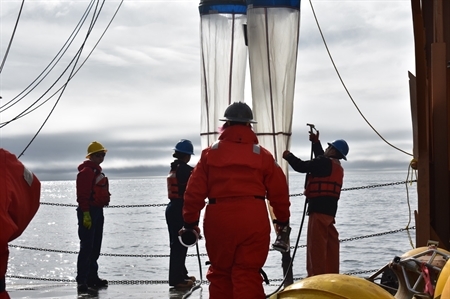 During the mission this summer, scientists are also collecting tiny zooplankton and larval fish by dragging 12 foot-long plankton nets called “bongo nets” behind the Healy. Using microscopes, scientists study samples collected by the nets to check the health of juvenile fish and examine the food they depend on.